Pakistan is attributed to the lack of access to basic health care services, poverty, lack of health infrastructure and personnel, illiteracy, women’s low status, inadequate water supplies and sanitation. In the urban areas, access to health care clinics and facilities is not a problem, though the general state and quality of public services is very poor. On the other hand, in the rural areas, people live far from hospitals and basic health care units. Similar picture is being depicted when considering the areas located at the outskirts of Karachi. People in these remote areas lack basic facilities. They are more prone towards getting skin diseases and diseases like diarrhea, mostly because of unhygienic environment and lack of awareness which make them susceptible towards infections and required particular attention of medics and paramedics. Keeping these indicators in mind HOPE- an Health NGO in Pakistan has initiated a step forward in collaboration with it partners to provide free health check-ups so that health status of these underprivileged masses can be improve and timely treated. Creating yet another example, HOPE- an NGO in Pakistan this time with the help and support of Orient Overseas Container Line Company organized a medical camp in Razzakabad- Karachi, located in the southeastern part of the city. Where people were offered free health check-ups along with free medications. Hundreds of adults and children flocked for this camp and a large number of patients were treated against skin disease, pneumonia, chest infection, diarrhea, eye and ear infections. Health team comprising of doctors and paramedics took initiative to provide medical care to the needy. HOPE- an Health NGO in Pakistan also formed a dispensary which remained busy throughout the duration of camp in distributing free medicines. Along with treating such diseases HOPE-an NGO in Pakistan believes in preventing disease from occurrence. Therefore in collaboration with Procter and Gamble Company, HOPE under the leadership of Dr. Mubina Agboatwalla- Child Specialist in Karachi distributed P&G Purifier of Water sachet among the community along with buckets and equipment necessary for the purification process of water. The community was also taught about how to use these sachets to purify contaminated water. The community appreciated the efforts of HOPE and its sponsor for their effortless hard work to improve the health status of community. These poor masses needs attention from those who are well-established in the society, which can contribute to improve their lifestyle. Hence, HOPE- an Health NGO in Pakistan will keep benefiting the low to lower-middle strata of our society. Water is one of the prime elements responsible for life on earth. Yet it is out of reach of majority of the people around the globe. It affects every continent and more than 1.2 billion people lack access to clean drinking water. While considering the province of Sindh in Pakistan, besides being one of the disadvantage communities when it comes to literacy and morbidity rate in addition, it happens to be one of the places where water is chronically short besides being dirty and contaminated. Women of these remote areas travel 5-6 km far from their village to fetch water. However, water well are set-up which are 250 ft deep from which both animals and humans drink water. Therefore, HOPE- an NGO in Pakistan has been helping the needy to obtain clean drinking water by installing hand pumps. 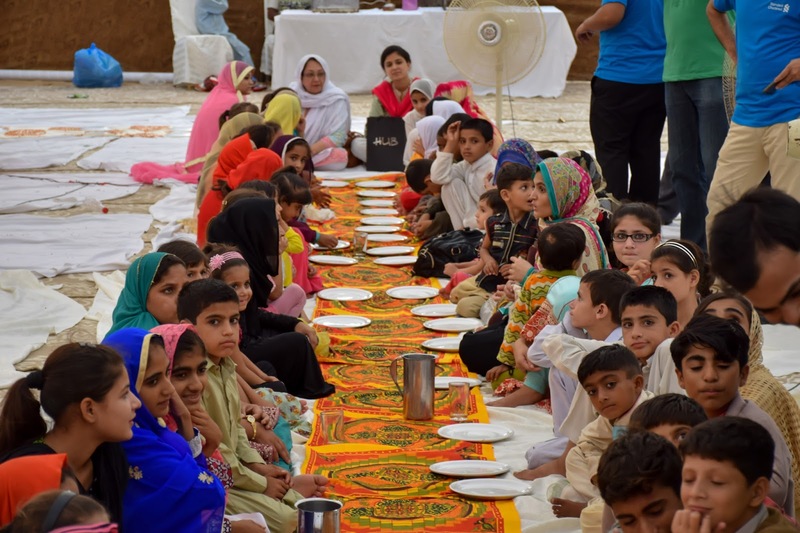 In this regard HOPE’s youth wing in the US focused their efforts amongst other youth groups and students providing them full awareness of the non-availability of drinking water in rural Sindh. This resulted in the formation of a support group eager to provide financial support for installation of hand pumps in selected areas in dire need of water. HOPE- an health NGO in Pakistan, was entrust in selecting the populated areas in extreme need on drinking water. The places for setting up the hand pumps were selected and up till now 19 hand pumps were successfully installed benefiting 100 to 250 household in each village. Like previous year, member of HOPE’s Youth Wing based in the US visited Pakistan to view and inspect these hand pumps. They appreciated the quality of pumps and were satisfied that their effort has created such a positive result and benefited the community as a whole. HOPE’s US youth wing’s representative Mr. Zain was accompanied by his family. All of them were extremely overjoyed to see how their support had benefited all the communities– especially with the fact that installation of these pumps saved these communities from migrating to areas with better accessibility to water. The beneficiaries presented traditional Sindhi Ajrak to the visitors in order to thank them for their efforts and as a return gift sweets were distributed among them. As always particular attention was given by Dr MubinaAgboatwalla- child specialist in Karachi. Eid-ul-Fitr, the famous occasion is being celebrated in Pakistan on the second week of July 2016. Every year Eid celebration starts with the commencement of the Ramadan. Muslims wear new dresses, shoes and other accessories just to celebrate this day with full delight. Eid is a joyous occasion for all the Muslims. The true essence of Eid can be accomplished through sharing happiness with deprived people. If people from poor class remain famished; the whole happiness of Eid will tarnish. The impoverished class is deprived of all the basic amenities of life. The basic purpose of Eid and Ramadan is not only to feel the pain of the meager people but also to take care of their needs. Keeping this essence in mind HOPE- an NGO in Pakistan work hard to benefit as many children and underprivileged masses across Pakistan as possible. 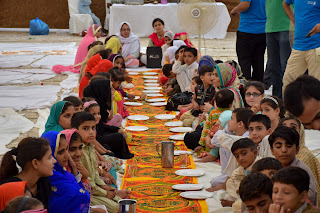 HOPE- an Educational NGO in Pakistan in partnership with different sponsors and donors across the world effortlessly collaborate to make Eid-a joyful event for the children. Therefore, Atlas Group believing that if we share pleasure and delight with the less fortunate people to reduce their misery; they will feel happy, visited HOPE Zia school where they spend time with the students and conducted different activities to make this event a memorable one for the students and which can contribute to make their Eid a wonderful and unforgettable event. The Atlas team presented a puppet and magic show along with arrangements were made for face painting for the children which was enjoyed and appreciated by them. They also gave chance to the young leaders to come forward and present their talent in the form of signing. The students presented naat and different national anthem. After the activity concluded, the Atlas team celebrated Eid clothes among children adding to the happiness of the children. The Eid gift also includes sports material for the students. The team and the children both enjoyed their time together and given feedback about how well-groomed and disciplined students are. 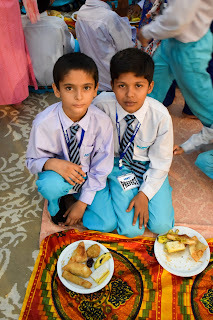 The students also left with a big smile on their face making their Eid more joyful occasion . 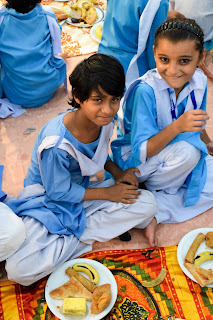 HOPE- an NGO in Pakistan under the supervision of Dr. Mubina Agboatwalla- child specialist in Karachi will keep working hard to improve the living standard of the children and poor communities by fulfilling their basic rights and bringing smiles on their faces. Even before the beginning of Ramadan, we start preparing for Ramadan with great excitement, we look forward for Eid feasts and our long awaited family reunions. Then there are those unfortunate members of society, who can’t even afford to buy a full meal, let alone the luxury of wearing new clothes. For the children belonging to low-socioeconomic backgrounds, it gets even worse. It will take time to fully eradicated the poverty but we surely can do something to lessen the pain! HOPE-an NGO in Pakistan, has taken the initiative to spread joy and smiles among the children of HOPE schools. As in the preceding years HOPE- a charitable NGO in Pakistan once again arranged a Grand Iftar sponsored by Standard Chartered Bank. This time it was held at a P&T ground to accommodate a very large number of people. Approximately 1600 students from several HOPE- an educational NGO in Pakistan, schools along with a hundred Standard Chartered volunteers participated at the Iftar party. The Children enjoyed the occasion as much as the visiting Standard Chartered guests. Moreover prior to Iftar, volunteers from Standard Chartered visited school and conducted activity regarding entrepreneurship for the students. 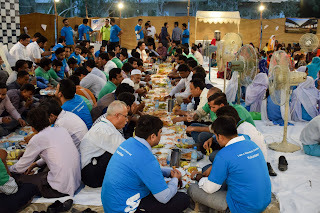 Iftar was served immediately at maghrib and the students and the guests were provided with a variety of delicious eatables and cold drinks to break their fasts with. 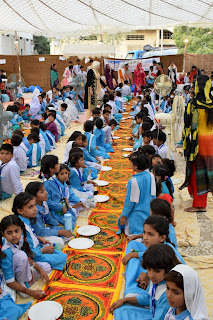 Dr Mubina Agboatwalla, child specialist in Karachi made sure that all preparations and arrangements were appropriate and that all the guests, students and staff were properly served. It was at this point that all the children were given free clothing sponsored by Act of Goodwill and given by Dr Mubina Agboatwalla, child specialist in Karachi, making them all ecstatically happy. After which, dinner was served at this point in the form of biryani. Then the children lined up again to board their respective buses to go back to their respective schools and on wards to their homes, thus bringing a very eventful and happy evening to a close.